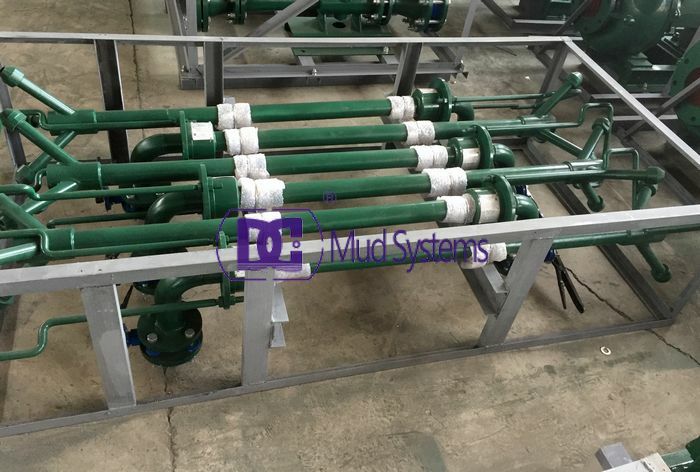 Mud Gun is a bottom type mud gun, the Mud guns are meant to provide supplemental or primary mixing in mud tanks depending on the number being used and the pit size. They are best used in tank corners to keep solids from settling and a mud agitator is placed in the tank center. 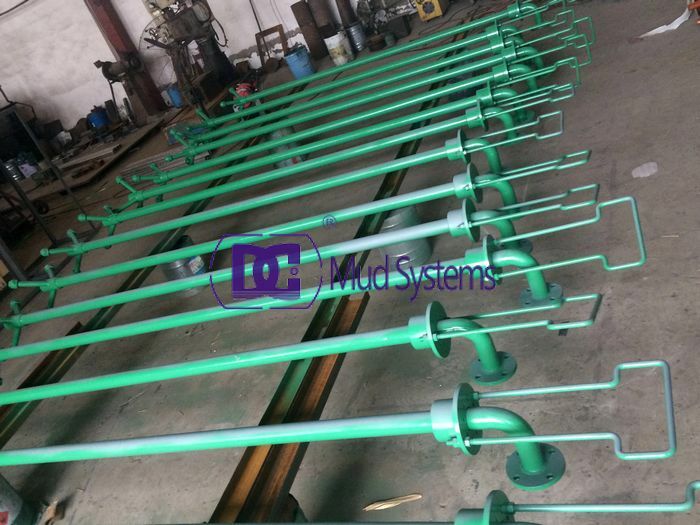 China solid control equipment manufacturer shipped 20 pcs low pressure mud guns to foreign clients who are our long terms business cooperator from 2013. The Mud Gun is designed to provide primary mixing or supplement in the mud-tanks depending upon the pit size and the numbers being used. They are used mainly in the corners of the mud-tanks to avoid the setting of solids. DC Solid control got the 12 pcs mud guns from abroad and packaged well to delivery this days. 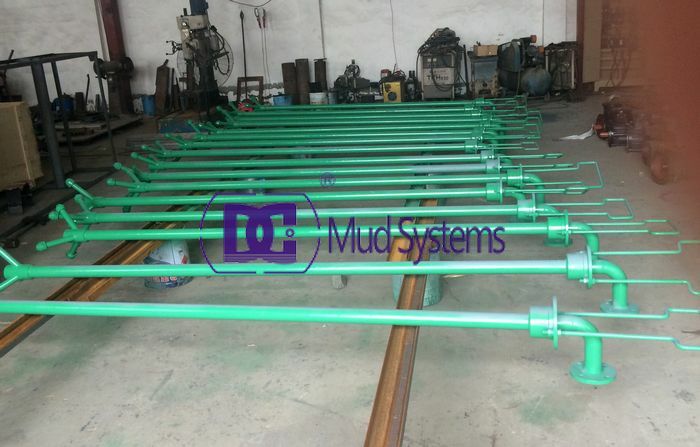 DC offered mud gun is considered to be one of the best assortment in the oil and gas industry. With a nozzle insert that is lined with a engineered elastomeric, our mud gun holds up and last longer and will not wear as easily as the common steel insert types. which is better for the wear on mud pumps. Also has a 360˚ rotating swivel style body and collapsible handle, as well as the ability to be customized to any length, flanged , threaded type. 3″ low-pressure guns are constructed of rugged materials to resist wear and corrosion for long life in harsh conditions. The 3” unit is intended for high volume applications, such as mud mixing systems that employ centrifugal pumps. 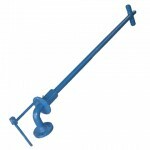 DC Mud Guns are available with handles, which make it easier to rotate the unit on its integrated 360° swivel joint. Call or email today for a quote on these mud guns. thank you. Mud gun is a device used to agitate drilling mud on a drilling rig. More of a nozzle than a gun, a mud gun is connected to a pump to circulate the drilling mud and prevent the solids from settling in the mud tank. There are massive stockiles mud guns in DC warehouse to wait your inquires. In order to keep the mud as fluid as possible, a mud gun is used to keep the tank agitated and mixed. Mud is made by mixing water or oil with a clay-like substance that also contains numerous other chemicals into a large tank called the mud tank on a drilling rig. The mud gun designed by DC Machinery has a simple structure that offers a flexible operation and is easy to be used. It is commonly used to defend against the precipitates in the solids control system. The equipment is installed in mud-tank. The equipment is used to jet the high-pressure drilling fluids inside the mud-tanks, in the bit to avoid the deposition of solids at every corner of the pump inlets and mud-tank. DC Mud Guns are available for rotation adjustment to allow the operator to optimize the mud guns performance. The replaceable wear resistant jet nozzle is used, which is special design with better shearing. 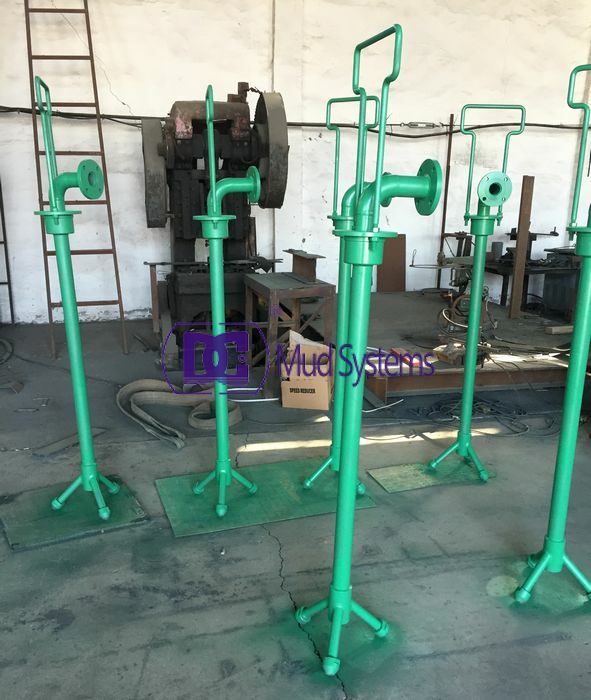 DC solids control manufacture 2” mud gun and 3” mud gun, and we have several sets of mud guns in stock to meet the urgents requirements of any models. The mud guns are the common type which located on the top tank, sometimes we design it as bottom tank type. Top tank mud gun is controlled by staff on the tank, the difference between DC mud gun and NOV mud gun is the nozzle numbers, we make to 3 nozzle numbers, which can jet more place in the tank so the agitating effect can be better. If you have interest with DC Mud guns, please send your inquires to our mailbox, at there you will getting a big discount of it. Mud Gun is a tank-installed tool mainly used to mix and suspend particles and also to reduce solids build up in tank corners. Best used in tank corners to keep solids from settling with an agitator placed in the tank center. Provide supplemental or primary mixing. 75 ft of head at 100 gpm for optimal performance. Rotating swivel have lubrication fittings and the ball bearings and seals are easily replaced . Mud guns for submerged service are highly effective at producing flow currents that boost fluid movements and aid in the suspension or mixing of particles. Mud guns can create an altemate product when used in conjunction with agitators. Three inch low pressure guns are constructed of regged materials to resist wear andcorrosipn for long life in harsh conditions, and ball bearings and seals are easily replaced. The 3″ unit is intended for high volume applications, such as mud mixing systems that employ centrifugal pumps. At home and abroad all adopt rectangle structure drilling fluid circulating tank at present, because of the moving performance is good. On the tank, there are many mud agitators for stirring drilling mud, but still have some dead angles. 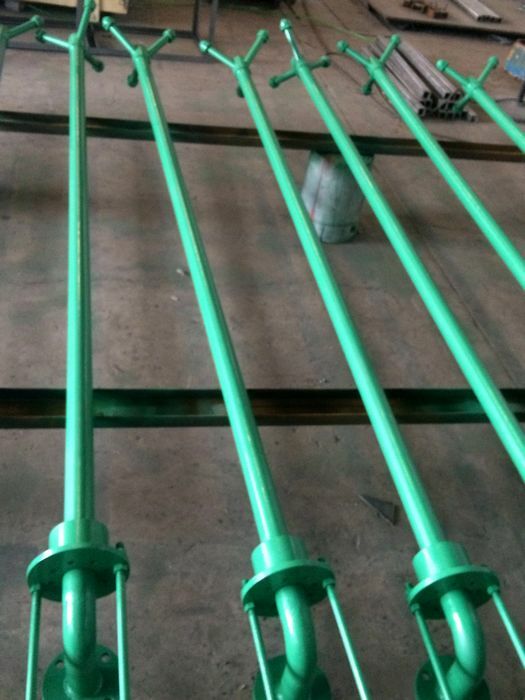 For solving the problem, at abroad, people install the low-pressure hydraulic mixing lines with a nozzle in tank, and the domestic use the mud gun which is installed on the tank roof to stir the dead angle. Research shows that the effective depth of mud gun is only 1.5~2.7m, the size is related with drilling fluid density, viscosity and nozzle speed. In using process, we should pay attention to mud gun nozzle cleaning, prevent mud nozzle blockage, and pay attention to mud gun valve adjustment, according to the density of the mud to adjust the valve size. In drilling fluid solids control system, only use drilling mud gun is not enough for stirring, we also need mud agitator, but for the dead angle of mud tank, it is indispensable equipment. 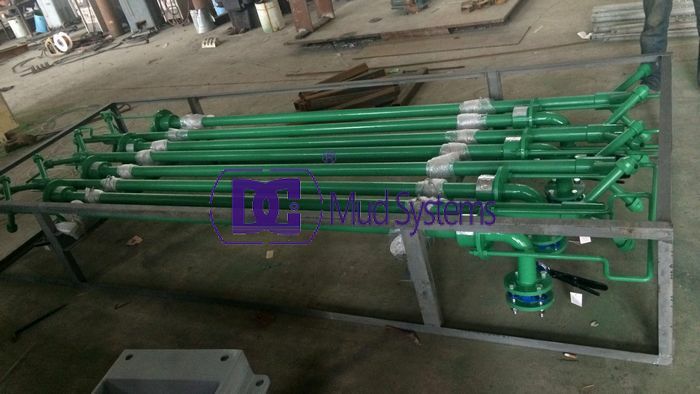 Mud gun is designed for use in a solids control system of a drilling rig. It is one kind of special tool which mainly uses for mixing drilling mud in the circulatory system and prevents the mud precipitates. 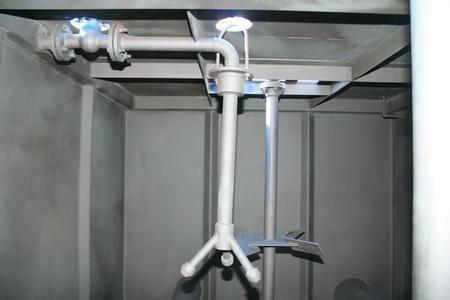 The structure of drilling mud gun is simple, flexible operation and easy to use. 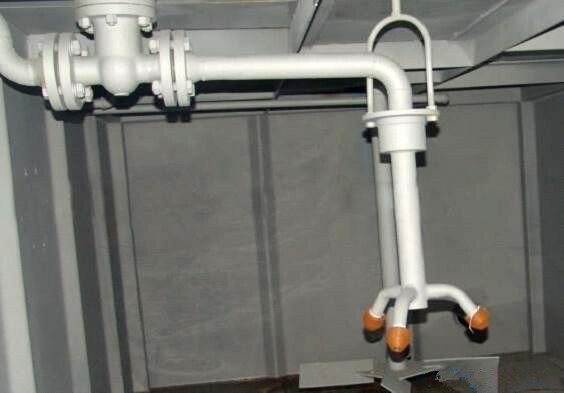 A mud gun is the ideal equipment to guard against precipitates in a solids control system. It is installed in a mud tank. Furthermore, it is usually used together with mud agitator. They have similar configuration principle on one mud tank. DC Mud guns include many types. Divided by pressure, there will be high pressure and normal pressure. Divided by rotary type, there will be with manual rotary or fixed type. Divided by diameter, there will be 2″ (NJQ50) and 3″ (NJQ80). Divided by nozzle number, there will be single one and triple one, etc. Divided by valves, there will be gate valve type and butterfly valve type. NJQ mud gun is a professional drilling fluid mud cleaning equipment produced by DC Machinery, especially used in fluid system. 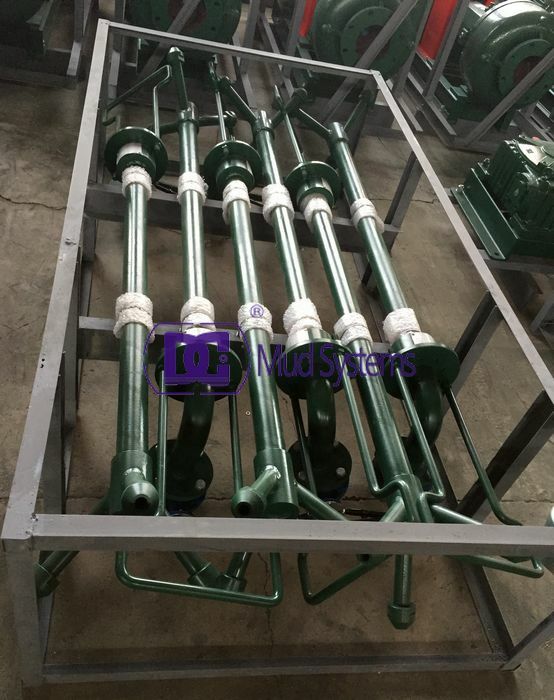 The fluid for the mud gun can be supplied by the Centrifuge Pump or mud pump. The mud gun can prevent the layering of the fluid by the rapid extrusive liquid flow to mix homogeneously of the drilling fluid. Remarks The length can be changed according to the requirement of customers. DC Machinery suggests you take mud gun together with mud agitator. This will enhance efficiency of equipments. The numbers and material of nozzle can be customized by clients. Any interest or questions please contact us freely.